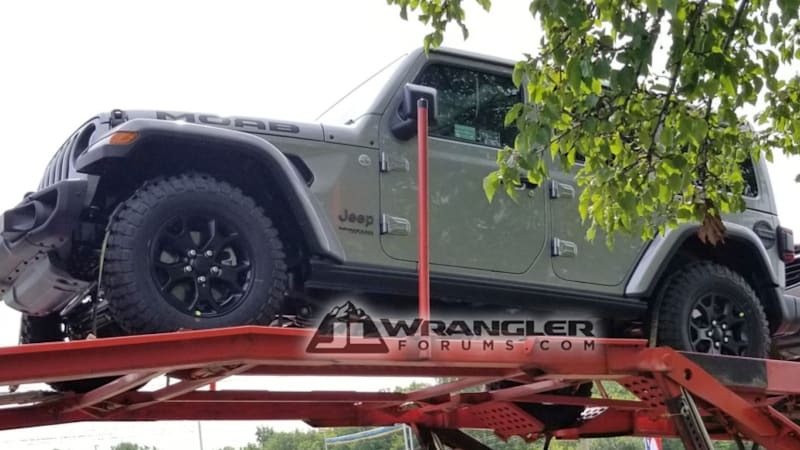 2019 Jeep Wrangler Moab spied near FCA headquarters? NEWS Get all your JEEP news before everyone else! If past history is any indication of future realities, expect to see a bunch of special editions and new model designations for the new JL Jeep Wrangler starting, well, right about now. A member at JL Wrangler Forums spotted a car carrier about 10 miles from FCA headquarters on which sat a couple Wranglers. And one silver Unlimited model was wearing a conspicuous set of Moab stickers along with a bevy of bits and pieces cribbed from Jeep's expansive aftermarket parts catalog. In addition to the Moab labeling, this Wrangler sports steel bumpers, blacked-out wheels and trim, and beefy BFGoodrich Mud Terrain KM2 tires. We also note body-color fender flares and a set of rock rails to keep the bodywork protected from boulders. We only have one image and we can't see inside, but our guess is that the Moab would sort of bridge the gap between the stylish Sahara and off-road-ready Rubicon models. JL Wrangler Forum members seem to think this is the real deal and not just some stickers affixed by a dealer, but without more images or official confirmation from Jeep, we can't know for sure. But we'd be shocked if more Wrangler variants weren't in the works for the 2019 model year. In other words, stay tuned for more.